The cabin has seen better days for sure. In fact, with the roof collapsed and windows gone, I doubt if even mice live there any more. The setting is beautiful, however, in an open field between the base of a forested mountain and the banks of the Pack River. On a sunny day in late summer, it seemed like an ideal place to be. Looking into cabin through front door. I’ve wondered about this cabin for years. If you look to the east at just the right spot on the Lower Pack River Road, when the leaves are off the trees, you can catch a glimpse of the tiny cabin set at the base of the distant hill on the far side of the river. 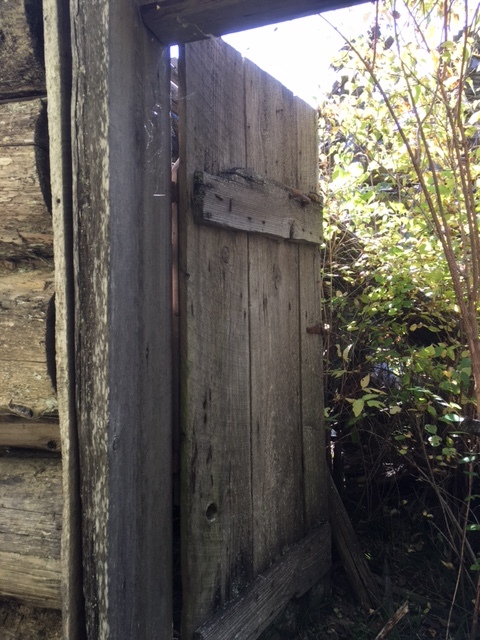 As I set out to write about this cabin, however, I kept getting bogged down. I finally realized that I see this particular story in multiple layers. There’s the just-the-facts-m’am research into the family that lived there; there’s the story about making assumptions based on too few of these facts; and there’s the story of “institutional memory,” how research for one project can apply to a totally different one decades later. I’ll wander through these layers in reverse. Back in 1977, while researching old homesteads on the Sagle Peninsula, Robert Newington told us that a man named Bob Nelson had built the two small log cabins on his parents’ homestead. Nelson was from Nova Scotia and was “a wizard with an axe and broadaxe,” Newington wrote. After selling his homestead right to Newington’s father, Nelson and his young wife moved to the Pack River neighborhood sometime in the 1890s. Bob Nelson’s name stuck in my mind and I thought of him occasionally when I noticed the lonely cabin in the distance. Part of General Land Office map, surveyed in 1901, printed in 1903. After seeing the little log cabin in person, I wanted to know if this was really Bob Nelson’s home. A search through land records showed Robert B. Nelson did indeed homestead a nice piece of land along the Pack River, just south of the confluence with Trout Creek. His claim for nearly 160 acres, approved in July 1905, included not only the field where the cabin and log outbuilding are located but also a large open field across the river. I also delved into census and marriage records available at the LDS Family History Center on Schweitzer Cutoff Road. 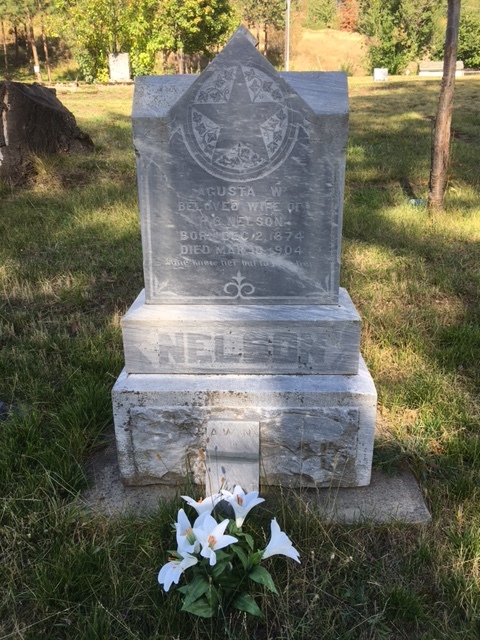 I learned that Robert and Agusta Nelson married at Garfield Bay on January 31, 1895, when she was just 20 and he was 35. Their first child, Lovell, arrived before the end of the year and others followed in quick succession: Fremont (1897), Bell (1899), Archie (1900), Maude (1902), and Florence (1904). Most likely complications set in after this last birth and Agusta died on March 10, 1904, when Florence was less than two weeks old. She was buried in the Hope cemetery. Now here’s where my assumptions initially led to the wrong conclusions. When I looked at the small log cabin and thought about a family with six children there, I assumed that they must have been poor. In fact, I couldn’t even imagine how they could all fit in such a small building. Following my incorrect assumption, I went to the Hope cemetery thinking that I might have trouble finding Agusta’s grave. Instead of a modest marker, however, I found a large granite monument, larger than those on the surrounding graves. Clearly this family was not poor. That’s when I began to look for evidence of a larger home on the property. I could find no written records, but newspaper articles did describe Bob Nelson as a “well to do farmer near Hope.” A.J. Helgenberg at the Forest Service office in Sandpoint dug out aerial photos of the lower Pack River area taken in the mid-1930s, and these at least partially solved my question. A careful look shows that there was a large L-shaped building near the cabin, most likely the home where the Nelson family lived. There is no way to know, of course, just when this house was constructed but I like to think that the Nelson family lived in some comfort. 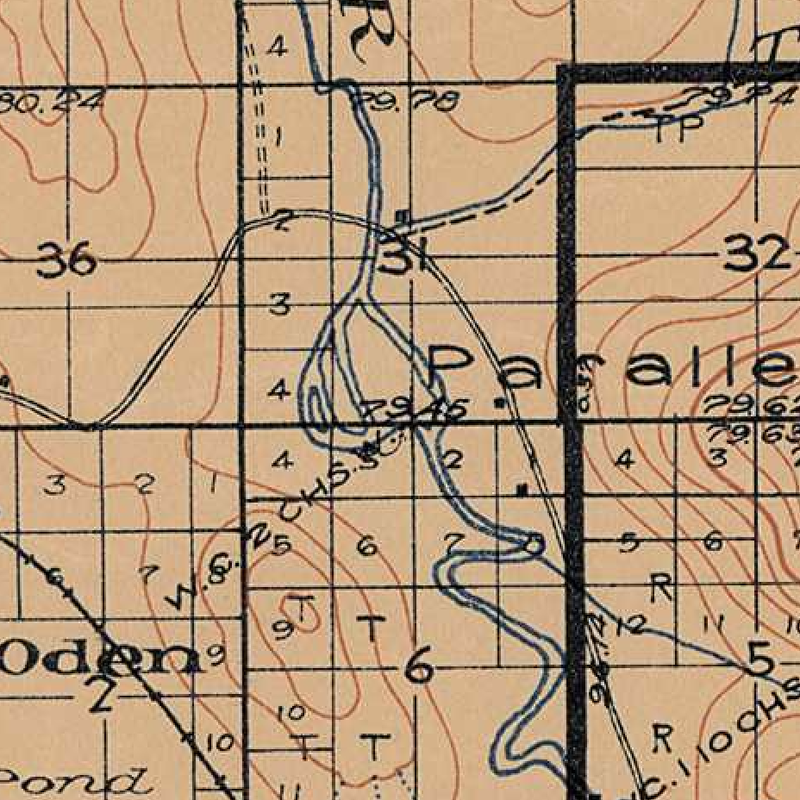 Part of 1913 Forest Atlas map showing highway crossing Pack River just below Nelson home in Sec. 31. 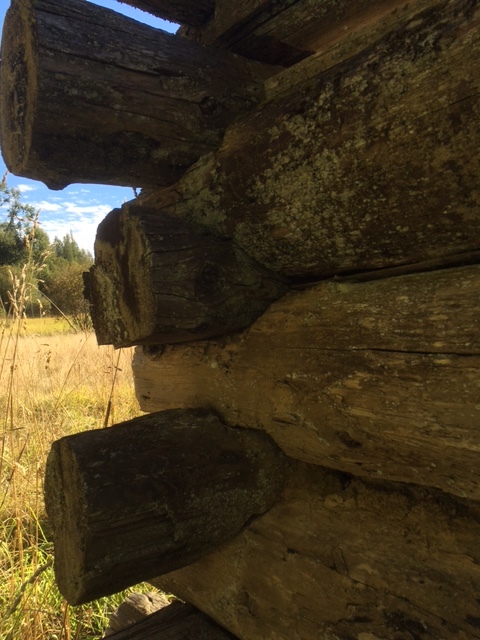 Looking at the remote location of the Nelson’s cabin, accessible today only by a trail along the river, it’s easy to make the assumption that this was always the case. Once again, a bit of research into old maps shows that this was definitely not true. 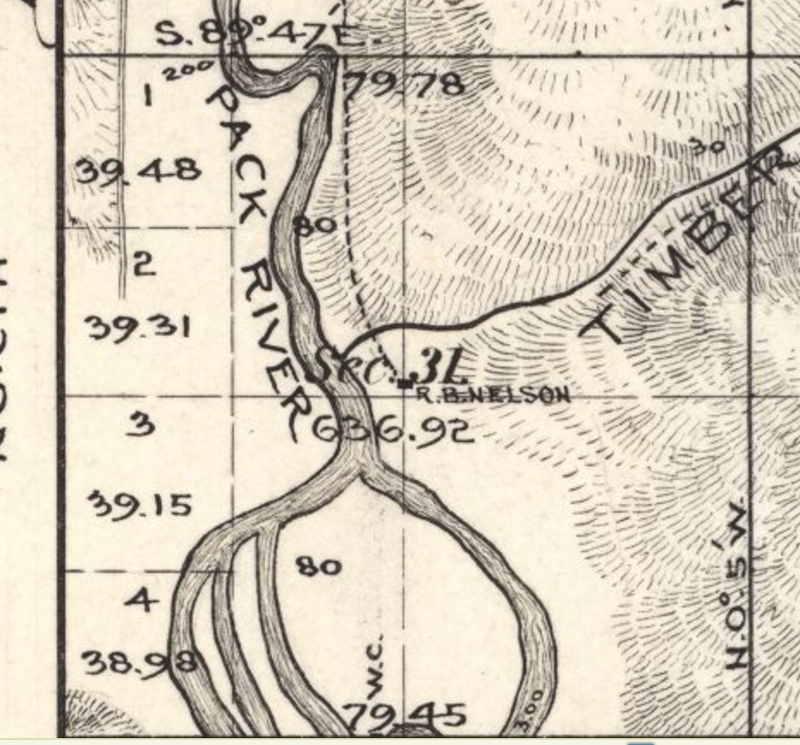 The original highway connecting Sandpoint and Clark Fork crossed the Pack River just a short distance south of the cabin. While the bridge is long gone, there is a small dock on the east bank at the original crossing. Standing there, you can still see some of the pilings in the river. Setting aside incorrect assumptions, the facts show that the Nelsons had experienced tragedy even before Agusta died. While living near Kootenai late in 1903, little Maude, then just 18 months old, wandered onto the railroad tracks and was hit by a train. While seriously injured, the little girl survived. Bob Nelson later sued the Northern Pacific but I did not find any resolution of the case. Three years after Agusta died, Bob Nelson married Matilda McLaughlin, a widow from Rawlins, Wyoming. She was close to Nelson’s age and may have brought at least one of her four children into the large blended family. The marriage did not last, however, and Bob and Matilda were living separately by 1910, Bob with his six children at the farm on Pack River and Matilda in a rented home in Hope. Robert Nelson filed for divorce in 1916 but for some reason this was not finalized until 1923. Nelson sold his farm in 1919 to Edmund W. Wheelan for $2,175, subject to a $2,000 mortgage to the Federal Land Bank. Wheelan resold the property just over a month later for $3,000. Bob Nelson returned to Canada with three of his children in 1919. He died five years later in Pouce Coupe in the Peace River region of British Columbia. He was 64. 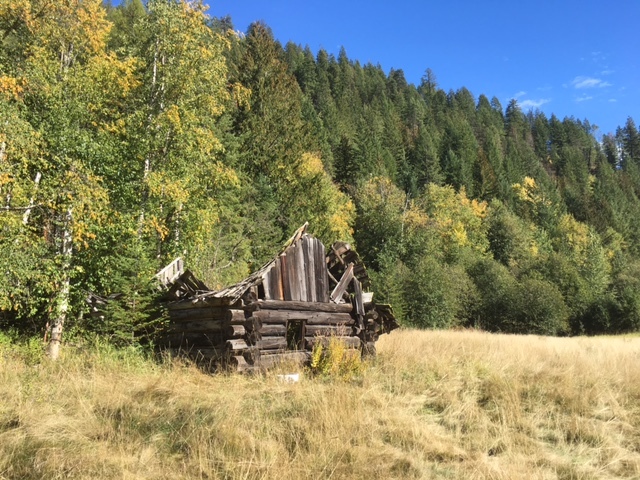 Bob Nelson left Bonner County nearly 100 years ago but his lonely cabin reminds me that real people lived and died here, men and women worked hard on this land to support their families, children played in the sunshine and the snow. I also am confident that there is much more to the Nelson story that I will never know. Sources: Robert Newington to Thomas Renk, 27 March 1977, pp. 6-8, on file, Flume Creek Historical Services; Map of Township No. 58 North, Range No. 1 East of the Boise Meridian, Idaho (Boise City: Surveyor General’s Office, 26 January 1903); Bonner County, U.S. Patent Homestead, Book 1:451; Western States Marriage Records Index, Marriage #7794, recorded in Kootenai County, Book B:268; Lovell B. Nelson, Idaho Death Index 1890-1964, Certificate No. 114652; Fremont Sevell Nelson, Idaho Birth Index 1861-1914, Certificate No. D60-0195; Bell Emeleme Nelson, Idaho Birth Index 1861-1914, Certificate No. D54-0528; Archie Nelson, Obituary Daily Times Index, 1995-Current; Maude Nelson, Idaho Birth Index 1861-1914, Certificate No. D54-0975; Florence Nelson, Idaho Birth Index 1861-1914, Certificate No. D70-0260; “Mrs. Robert Nelson Dead,” Northern Idaho News, 11 March 1904, 3:3; “Hope Brevities,” Northern Idaho News, 8 December 1905, 4:1; Forest Atlas, Sheet 12 (Missoula: US Forest Service, 1913); “Little Child Is Struck By An Engine,” Northern Idaho News, 6 November 1903, 1:3-4; “District Court Term To Be Extended One,” Northern Idaho News, 3 February 1904, 7:1-4; Idaho, County Marriages, 1864-1950, 004533535, frame 275 of 702; Twelfth Census of the United States, 1900, Wyoming, Fremont County, Split Rock, Roll 1826, page 7A, Enumeration District 0029; Thirteenth Census of the United States, 1910, Idaho, Bonner County, Hope Precinct, Sheet 2A and 8A; Robert Nelson v. Matilda Nelson, Divorce Suit 1761, 1916; “Many Cases Disposed Of In District Court,” Pend d’Oreille Review, 4 October 1923, 1:6; Bonner County, Deed Record, Book 35:45, Book 36:164-165; Border Crossings: From U.S. to Canada, 1908-1935, Roll T-15313; British Columbia, Canada, Death Index, 1872-1990, GSU No. 1927302. This entry was posted in Uncategorized and tagged Agusta Nelson, Bonner County agriculture, Bonner County history, Matilda McLaughlin, Matilda Nelson, Robert B. Nelson. Bookmark the permalink. Another nice one Dr. Renk! Why thank you, Dr. Miss! I love the speculation about the large family that lived there! Do you have a picture of the cabin from further away that you can share? I tried to get a photo from Lower Pack River Road but it was just too far for my little phone camera. Sorry, Becca! And I would love to see your photos, Alan! You can easily access the cabin from Trout Creek Road. It’s probably a 15 minute walk, mostly level, from the trailhead parking. I came across your fabulous article today upon researching Matilda McLaughlin. My three sisters and me are descendants of Robert B. Nelson (great-great grandfather). This was a fabulous article and filled in a few holes where we had questions. Loved the photos of the cabin! If you have any further information you could share with us, please contact me. Two of my sisters are heavily into geneaology research and have been doing so for ~ 30 years. Thank you!! How nice to get you message, Pamela! Thank you! I will contact you via email to let you know what info I have. I’m more than happy to share.